I was born on a bright summer’s morning according to my mother’s autograph book, July 19th, 1921. Ten pounds in weight and named Sarah Agnes. According to Mum she told Dad to name me Hazel Rosemary but Dad, who till the day he died I’d never seen affected by liquor, got drunk with his shipmates on the way to the birth registry, couldn’t remember Mum’s names so named me after his eldest sister and his mother. I was always and still to this day, called Sally. My Grandmother lived on the corner of Nairn & Market Street and we lived in a cottage on Collie Street, no. 22, now an estate agency. 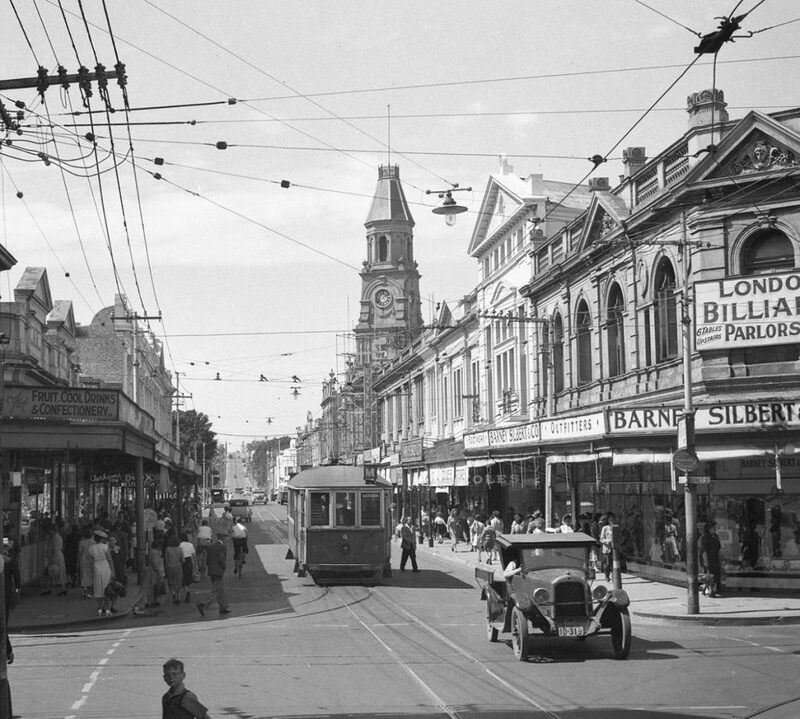 In those days, 1921-1941, all around Collie, Nairn, Essex and Marine Marade, there was a polygot of nationalities, Italians, Yugoslavs, Portuguese, Germans, English, no Asians – white Australian policy was enforced then I believe. There was a Japanese laundry in Bannister Street and two Chinese fruit & vegetable shops in South Terrace though. An Italian family, named Vinci, lived in 20 Collie Street and when they moved the Gumina’s came to live there. In 23, a Greek family named Anastas lived, in 26, another Italian family, the Rottendellas – red headed or as the Italians say titian headed. No. 26 is now a restaurant. Next door to my Gran in Market Street was a wonderful Italian lady, Mamma Migliore. Mamma had seven sons and always yearned for a daughter. When she eventually had a daughter after 17 years the daughter was stillborn and Mamma died. Tony, one of her sons, was a very dear friend of mine till he died a couple of years ago. He was born a month after me and we always kept in touch through the years. 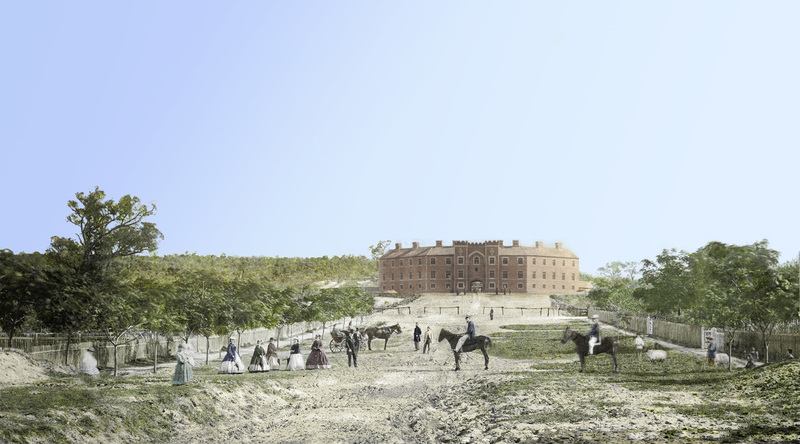 Hand-coloured or tinted photos have always been around since there have been photographs to colour. Sometimes it’s just a hint of a tint and in the more blatant efforts it looks more like the result of Homer Simpson’s makeup gun set to ‘whore’. Over the years I’ve become self-taught in a number of computer programs but the one I have the most fun with is Adobe Photoshop. Combined with my interest in genealogy it wasn’t long before I starting figuring out ways to use old and historical photos. I started hand colouring (I figure I can still use the term since my hand is on the mouse!) some old photos in the family albums and was quickly hooked. Sometimes the end result could blow your mind as you flick back and forth from the original image. 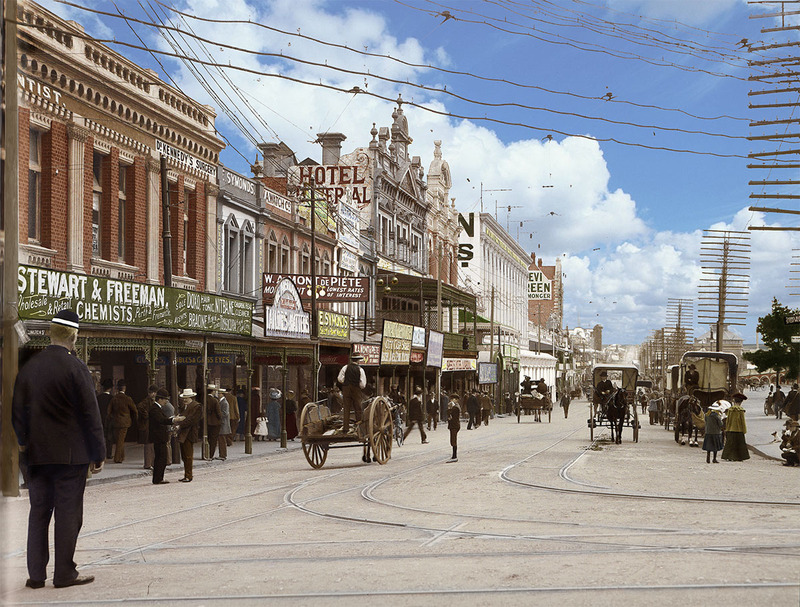 Lately I’ve been colouring historical photos that have been popular on the Facebook group Lost Perth, widely successful in Western Australia where people having been digging up old photos of Perth’s yesteryears and posting them online for everyone to reminisce over. My favourites are pre-1900 images. The further back the date of the photo, the harder it can be to imagine it in realities hue. 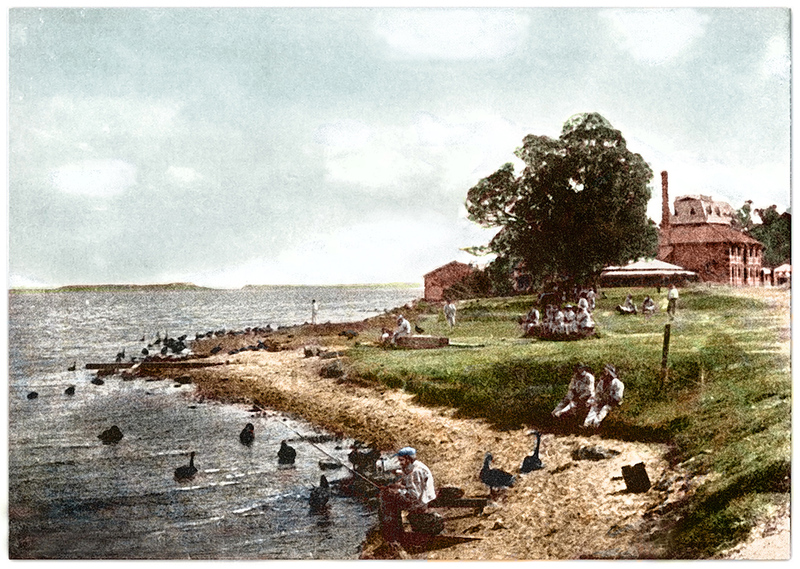 The first hand coloured photo that I posted was an image of the Old Men’s Depot that used to sit on Mounts Bay Road, right on the river. It’s such a beautiful image with all the elderly men relaxing by the foreshore and black swans swimming about. It’s not the clearest image and quite grainy, not ideal for colouring but it was a favourite that I really wanted to bring to life. It was a bit hard to make it resemble reality due to the graininess but I think it turned out alright. 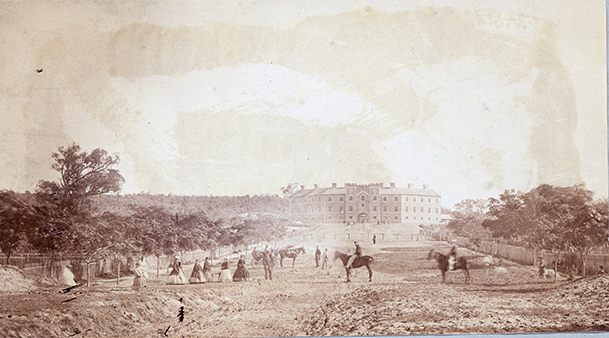 The next photo I chose is one of the oldest landscape photos of Perth and shows the Pensioner Guard Barracks just after they were built in 1865. This was a popular choice as the Barracks were demolished in the 60’s with only the arch remaining so while the arch is a Perth icon, not many really knew about the Barracks as a whole. In fact I coloured this photo twice. The first time I only had a cropped version and it wasn’t until I applied to the State Library of Western Australia for a hi-res copy of the original, that I saw all the wonderful things happening on the sides. On the left is a woman holding a baby. Another woman rests on a grassy mound. On the right are two boys tending their sheep, while a girl stands at the gate to her house. Three other children are also playing nearby. Some commented that they’d love to buy a print so I applied at SLWA for reproduction rights and can now sell these as photo prints or on a canvas in a variety of sizes. More painted photos to come!